It's official: the HTC Hero is to go under a different moniker for T-Mobile, with the telco calling the device the HTC G1 Touch. Obviously not content with having a Hero in its phone collection, T-Mobile is naming the device so it sits neatly in its portfolio next to its original G1 release. This may also be to mask the fact that the company missed out on nabbing the HTC Magic from Vodafone. Just to reiterate what we already let you know earlier today, the G1 Touch comes with a 5MP camera with autofocus and video capture, large multi-touch screen and high-speed web-browsing, so that you can view all those lovely Google services that the Android OS supplies. T-Mobile has also announced that the G1 Touch will exclusively be available in black, so if you are tempted to the dark side, then T-Mobile is the way to go. Orange has also announced that it will be stocking the phone, and will call it by its original name, the HTC Hero. The HTC Hero will be available for free on select price plans from Orange and will be exclusive to Orange in 'Graphite' colour. 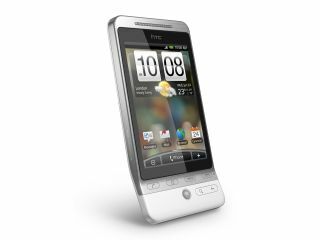 The HTC G1 Touch will be available from T-Mobile in July from £40 per month on T-Mobile's unique Flext 40 price plan. So, Orange equals Hero; T-Mobile equals G1 Touch. Got it? Good.